Civil War has robbed Margaret Logan of all she holds dear, including her beloved New Orleans home and her fiancé. When her family moves to the desolate Bolivar Peninsula to manage a lighthouse that is no longer there, all her hopes for a normal future are dashed. Her world is rocked once again when a wounded Yankee soldier washes ashore needing her help. 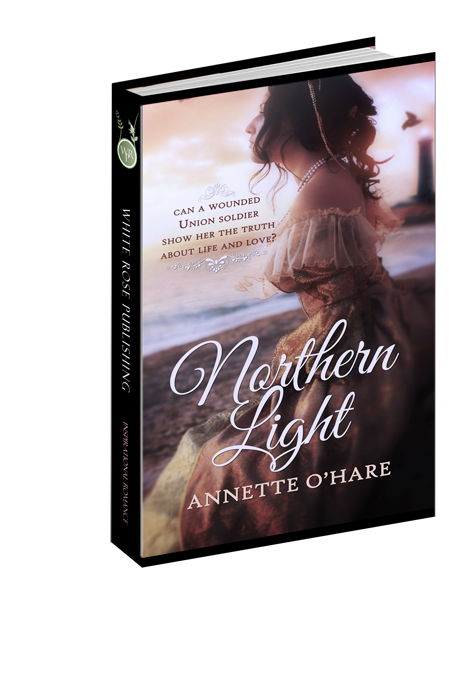 Despite her contempt for the North, Margaret falls in love with Thomas Murphy. As their love blooms, Margaret’s sister is overcome with neurosis, and her mind slowly slips away. Bitterness, psychosis and depression yield a decision fueled by contempt. Will one fatal choice cause Margaret to lose the man she loves and condemn Thomas to death? Margaret Logan shucked the calfskin glove from her hand and stuck it under her arm. Pain coursed through her middle finger as blood pooled at the tip. A single crimson drop fell onto the prickly cotton boll that clung tightly to the bush. Mama would have come up with a charming anecdote had she seen the deep red blood against the lily-white cotton. More than likely, it would have been some illustration concerning the blood of Jesus Christ and how it could wash a person white as snow. Saving grace was the last thing on Margaret’s mind. There was a long dingy sack trailing behind her that she needed to fill. Her family depended on the income they would receive come time to cash in their money crop: Sea Island cotton. She wiped the blood on the inside hem of her light blue apron and thrust her hand back inside the glove. The sight of blood sickened her. Plenty had been shed since the war began. Enough to fill a river from the Yankee North to the Confederate states of the South. The war had taken everything that was good and decent and ripped it to shreds. She no longer knew the tranquility of her beautiful lighthouse home near New Orleans. Nor did she have the loving caress on her cheek of her beloved fiancé, Jeffrey Fontain. Instead, she wiped the sweat of hard labor from her brow with her own calloused hand. “Yes’m.” She straightened. Pain surged through her back from being hunched over all afternoon pulling cotton. It made her happy to get out of the field for a while, even if it meant doing another chore. Elizabeth huffed and stamped her foot before returning to her cotton pulling. Margaret glanced at her mama, who gave her a nod and then turned away. She tugged the heavy cotton sack out of the field. It goaded Margaret to walk across the platform of what had been the base of the Bolivar Point lighthouse. Its absence had mocked her since the day they’d arrived on the desolate Bolivar Peninsula. Not even Papa was cut out for the grueling work of pulling cotton. He was a trained light keeper, not a common farmer. But like it or not, Margaret had to cross over the aggravating stretch of emptiness to hang her sack on the hook where they were stored. Removing her shoes, she collected her pail and slipped her feet into Papa’s heavy boots. A mild September wind tossed her skirt around as if she were dancing a reel. Pink powder puffs grew wild in the sandy soil as she walked the path toward the bay. The delicate flowers swayed to and fro in the gentle breeze. Margaret’s feet slipped inside the oversized boots. The warm sun felt nice on her shoulders, not blazing hot as it had been only a month earlier. She sensed a slight whisper of change in the air as a song found its way into her thoughts. It surprised Margaret when the words escaped her lips. The sweet melody comforted her. The words caught in her throat, and she looked around, nervous that someone might be listening. Satisfied there was no one around for miles, she continued. The song sounded nice, even if the words spoke of a poor young girl’s passing. Strange how death and dying didn’t seem to bother her as they once did. The war-torn bodies of Confederate soldier boys they’d found floating at the water’s edge cured her of any fears that death once conjured up. A strong odor of fish emanated from the bay where she regularly collected oysters. The receded tide caused the foul smell, letting Margaret know it was the perfect time of day for gathering. She walked a good distance past where the water had been earlier. Papa’s heavy boots sank into the mushy sand with each step she took. It was a chore to pull her foot out without leaving the boot behind. She stepped over clumps of golden-colored seaweed amassed on the beach, left behind by the outgoing tide. A lone hermit crab picked up his shelly house and skittered for the water. Surprised by the sudden movement, Margaret stopped in her tracks, nearly falling over backwards. Gathering food for the family was a welcome task. She would have rather rounded up a thick, juicy roast beef for their supper, but that was out of the question. Every head of cattle on the peninsula that the Confederate army hadn’t procured had been pilfered by hungry Union raiding parties. Her parents considered it a blessing to have access to the Gulf of Mexico and all the shrimp, crab, oysters, and fish they could eat. But Margaret, her two younger sisters, and brother had grown tired of every kind of seafood the Gulf had to offer. Oh, how she missed the taste of beef. She smiled, secretly imagining running into a young man with a nice fat cow who would trade her for some magic beans. She chuckled. The same gloves she’d used earlier in the cotton field were used to pick up the sharp oysters and place them in her pail. Back home, her mother had traveled the short distance to New Orleans to purchase seafood from the fish market. Now they depended on the land for their food, and if God didn’t provide it, they didn’t have it. Mama would reason that if they didn’t have it, they didn’t need it. Margaret would argue that point on a regular basis. There were several things she needed, like more books. But she’d all but given up on fighting that battle. “The only book you need is the Good Book, and it’s on the shelf.” Mama never listened to her. A girl stuck in the middle of nowhere, grieving the loss of everything she held dear, needed an escape, and she certainly wouldn’t find that between the pages of the Bible. Margaret came to a place where the pickings were abundant and filled her pail to the brim. One particular oyster caught her eye. She picked it up and noticed it stretched far beyond the end of her hand. Oh, if only there was a pearl inside to match the size of the shell. The thought made her think of her family’s yearly carriage ride to the Mardi Gras in New Orleans. How she missed the revelry, the mysterious, masked ladies in their magnificent flowing gowns. How they sparkled in the moonlight, their necks and ears dripping with diamonds and pearls. Beautiful, glistening pearls. Margaret swayed back and forth to a familiar melody, keeping time with the waves lapping around the big, cumbersome boots, the huge, sandy oyster clutched to her breast. With a sigh, she dropped the shell onto the sand, as she’d already collected plenty for supper. She noticed something shiny hiding amongst the oysters. Bending over, she set her pail down and pushed away some of the rough shells to see what it could be. Without thinking, she picked up the artillery ball. Her cheeks heated, and she shot up from the ground, the shiny ordinance still in her hand. “Oh, Lord, can’t I even do my chores without being reminded of the death constantly surrounding me?” she cried out in anguish and threw the ball down the beach. That’s when she saw him. The body lay half in, half out of the water. His clothing fluttered with the movement of the waves pulsing around him. Margaret looked heavenward and released a long breath. Slowly, she approached the bloody remains. His eyes were closed—he didn’t move. She knelt beside him and gazed into his face. Her heart felt heavy. Had he left a young woman behind to grieve like her Jeffrey had? Did she even yet know of her loss? Seawater colored the sailor’s outer garment, making it look darker. The standard-issue gray wool kepi was missing from his head, his dark hair long enough to sway in the water. He wore a mustache and beard, the color a shade lighter than his hair. Margaret extended a hand to his face. Such a handsome young man, probably the same age as her Jeffrey had been. She brushed sand from his cheek, her heart broken for whomever would grieve for him. A long slash ran the length of his forehead, and there was a distinct hole in his shoulder. A bloody gash on his side all but cut his belt in half. Her hand stretched toward the tarnished gold buckle. Realization dawned; the letters were not the Confederate CS, but the US of a Union sailor. Her mind flashed through the stories she’d heard about Union men and the atrocities they’d performed against southerners…especially women. Yankee raiding parties had taken almost everything useful from the peninsula. Instinctively, she scanned the horizon in search of any approaching Union military men, sailors or soldiers. She had to get away before his fellow sailors returned to collect the body. She crouched, poised to run. Before she could withdraw her hand, his eyes shot open and he grabbed her wrist. Margaret screamed in terror, trying to pull from his grip. What if he had a weapon? What did he plan to do to her? She pounded on his arm with her other hand, trying to free her wrist. But his grip was tight. “Please help me.” His voice was almost too weak to hear, but he peered straight into her eyes. His hand went limp and fell to the sand. Margaret stood and backed away, but both boots stuck deep in the sand. She lost her balance and fell backwards, landed on something sharp. The sleeve of her dress ripped. She grabbed her arm as blood seeped through the tear. A bloody, jagged shell had mangled her wrist. Tears threatened, but terror held them at bay and gave her the clarity she needed to get away. Margaret pushed off the sand and pulled her feet out, boots and all. Righting herself, she backed away, holding her injured arm, chest heaving with every breath. “Papa will know what to do.” She hiked up her skirt and took off. Despite the fact that her father’s awkward boots sank in the sand with every footfall, she quickly reached the trail toward home. Before the sailor was completely out of sight, Margaret glanced over her shoulder for another look at him, wondering if the ordeal had actually happened. But the searing pain shooting through her bloody arm gave her all the proof she needed. The man seemed to be awake again and was feeling around for something. Her hand covered her mouth and she let out a loud gasp. Dear Father in heaven, he’s looking for his gun! Question 1: The lighthouse is symbolic in this story. The book’s thematic Bible verse is Psalm 43:3a, O send out Thy light and Thy truth: let them lead me. Can you point out some of the symbolism associated with the lighthouse? Answer 1: At the beginning of the book the Logan’s find that the lighthouse has been completely dismantled and taken away because of the war. Margaret’s life is symbolic of the lighthouse in that everything precious to her has been taken away because of the war. At the end of the book the old lighthouse is replaced with a new one. This is symbolic of Margaret’s old life of bitterness and loss being replaced with one filled with joy. Question 2: Looking again at the thematic Bible verse (Psalm 43:3a, O send out Thy light and Thy truth: let them lead me) reveals another aspect of Margaret’s spiritual journey. She is searching for truth concerning the war and slavery. She doesn’t find the answer until she seeks God’s light and His truth. Other verses showing Jesus and God as light are, John 8:12 and Psalm 27:1. Take a moment and read these two passages. Discuss what these verses mean to you. Question 3: According to some Southerners, the Civil War was fought not only to free the slaves, but for other reasons as well. Some of the reasons are pointed out in the book. Can you remember what they were? Answer 3: States rights, Southerners weren’t allowed to sell their products anywhere but the North, the North taxed goods so high that Southerners couldn’t afford them. Question 4: Thomas and his family left Ireland because of the devastation caused by the Potato Famine. People are still flocking to the United States to this day. What are some reasons why they want to live here? Answer 5: A November 2013, CNN report states that suicide rates among U.S. veterans may be more than 22 a day. According to a 2012 report by NPR.org, the number of suicide deaths in the U.S. military surged to a record 349 last year – more than the 295 Americans who died fighting in Afghanistan in 2012. Question 6: In honor of Thomas’ heritage, the Logan family celebrate Advent for the first time. What are some of the ways you and your family celebrate the holy days? Question 7: In chapter eight, Thomas talks about the man who wrote Amazing Grace. John Newton worked with slave traders and got into considerable trouble. Later in life Newton was captain of his own slave ship. As the story goes, a violent storm came up and Newton barely escaped with his life. Reflecting on what happened, he penned the words to the famous song. He was a changed man. Do you know of anyone who exchanged a bad life for good? Answer 7: Franklin Graham, son of evangelist, Billy Graham was a self-proclaimed bad boy before turning his life over to God. Georgia Durante was a getaway driver for the mob before starting a stunt-driving company. Nixon aide, Charles Colson spent a year in prison because of Watergate before starting Prison Fellowship. Question 8: Margaret’s sister, Elizabeth does a terrible thing that forces Thomas to leave the Logan home. Margaret is alone once again. It takes a long time, but eventually Margaret finds it in her heart to forgive her sister. Have you ever had to forgive someone for a terrible wrong done against you? Question 9: When Ensign Miller arrives and tells the Logans that the North won the war and that Lincoln was assassinated, why do you think they were doubtful of him? Answer 9 Even though Lincoln’s Emancipation Proclamation went into effect January 1, 1863, the news didn’t reach the Texas coast until June 19th of 1865. Juneteenth is still celebrated in Texas. Question 10: Ensign Miller offers Mr. Logan a job as head lightkeeper for the new lighthouse and gives him money for expenses. Mr. Logan and his wife immediately realize that God is providing the money needed to get their daughter, Elizabeth the medical help she needs. Has there been a time in your life when God gave you exactly what you needed at just the right time?